In 1940 I turned six, brother Bodo was a cute two. I was allowed to invite all my friends to a birthday party, boys and girls. I was so fond of all of them. The older girls were both ten. One is my cousin Sigrid, the other my friend Sieglinde. 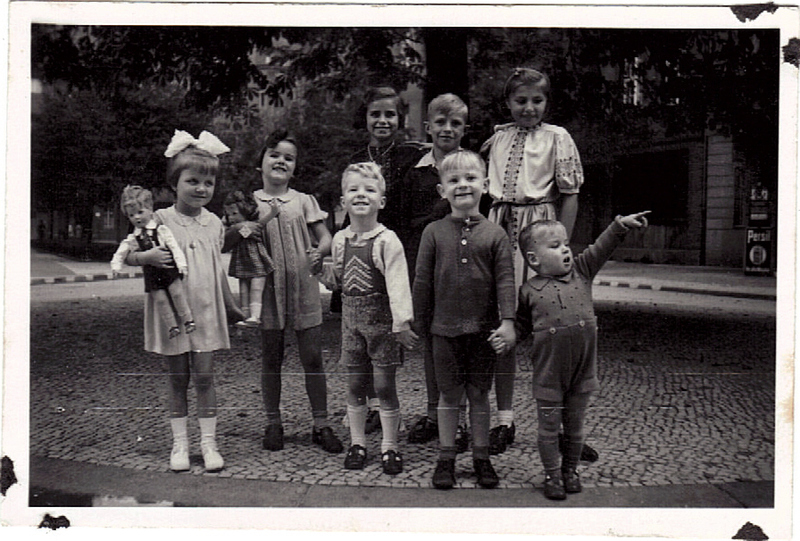 I think Sieglinde’s brother, who is also in the picture, is only eight. 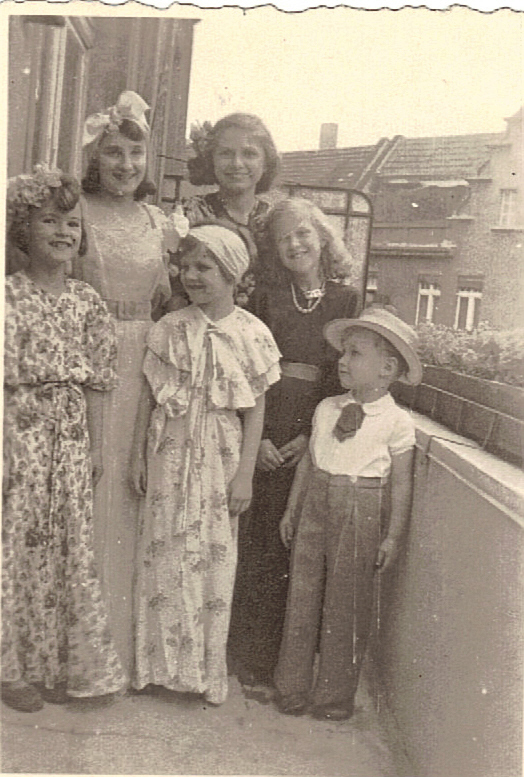 The younger girl with the huge bow on top of her head is five year old Eva. (I mentioned her a lot in my blogs.) 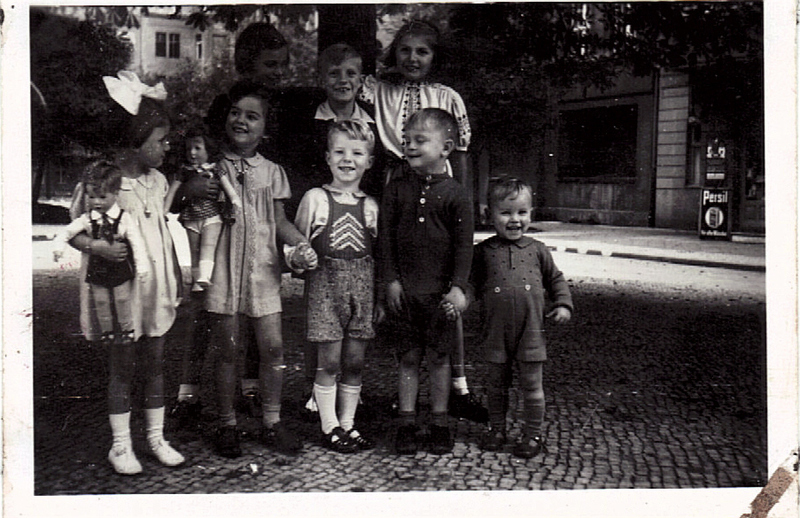 Apart from little Bodo there are adorable Jürgen and very friendly Heinz in the picture, who both lived in the same building where we lived. There was a huge chestnut-tree opposite, which still stands now. It grew a lot more over the years. I believe it is about as high as the surrounding five story houses! In the photos we are gathered under this tree and also in front of one of the sides of our house. Tante Ilse’s gift to me for my birthday were two Käthe-Kruse-Puppen, a boy and a girl. Of course they had to be in the pictures too. And of course Mum took all the photos which she always did on our birthdays. About two years later during summer we had a dressing up party. Mum took a picture of us on Tante Ilse’s balcony. I think my brother Bodo looks lovely in the picture dressed up in long pants. I wear one of Mum’s dresses. Friend Eva is in the centre of the picture. The lovely young lady in the long dress is my sixteen year old cousin Renata. 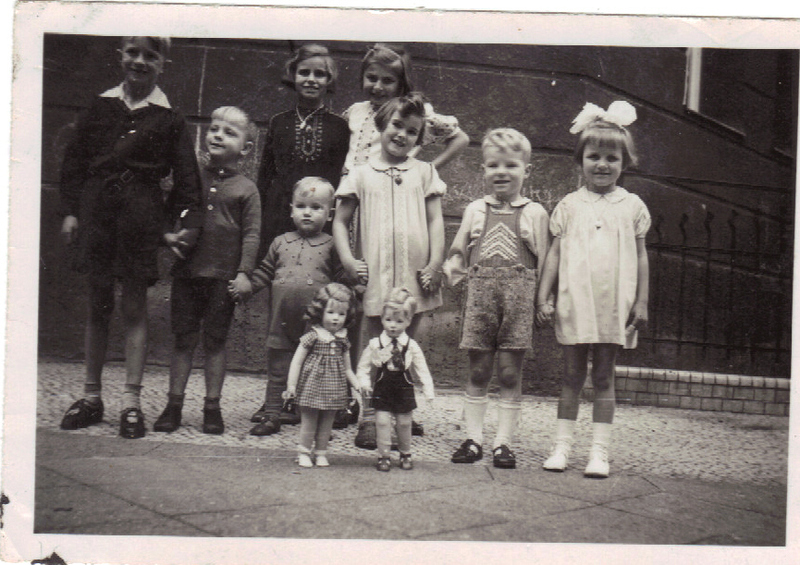 My friend Sieglinde on the right side is twelve and friend Inge with the blond hair probably ten. I think I wouldn’t have remembered the dressing up party if I hadn’t this picture. Pictures like these are truly a great memory boost! To my regret Mum exchanged the boy doll for black market goods after the war. I was left with the girl doll which my youngest daughter inherited. Thanks, Eliz, for your reply. So good to know you like the photos. It’s a great idea to post the old pics. It’s like a fusion of the old and modern times. Thanks for this comment, Nelson. Isn’t it amazing that some things don’t seem to change all that much? What priceless photos! I love the dress-up photos too. I used to play dress up with my sisters and my cousins. We would go through my grandmother’s dresses because they had more “drama.” Also, she let us take liberties with her things and she took particular pleasure to watch us strut around her room. You are so lucky to have so many photos you got to keep. Thanks, Mary-Ann, for commenting. I love the comment that your grandmother’s dresses had more “drama”. Your grandmother reminds me of an Australian friend of mine who always enjoyed letting the grandchildren go through some of her things which they could use for dressing up. I love those photos. I found your link on Believe Anyway! I enjoyed your blog. Thanks for visiting. Glad you enjoyed my blog. Your Welcome, I want to come back and read more! Jolly good. I’d like to read some of your blog. Am going to check it out soon. What an awesome memory boost for you indeed!